Valerie Jarrett poses in front of the conference room that bears her name at the Chicago satellite of The Wing. On a sunny Saturday morning in one of Chicago’s trendiest neighborhoods (Fulton Market in the West Loop), passersby may have assumed the long line of mostly millennial-aged women winding out of one of the area’s newly refurbished warehouses were awaiting entrance to the latest brunch destination—or perhaps a sample sale at an exclusive boutique. But the hundreds of women (and a few men and non-binary folk) gathered patiently outside the gorgeously designed, soon-to-open Chicago outpost of international women’s club The Wing were there to garner wisdom from one of the most accomplished and dynamic women in public service. Valerie Jarrett, the longest-serving senior advisor to President Obama, held court in her hometown on Saturday in celebration of her new memoir, Finding My Voice: My Journey to The West Wing and the Path Forward, published by Viking on April 2. While the world knows her as a political dynamo, Chicagoans recognize Jarrett as a member of a dynamic local family dynasty. Her grandfather, Robert Rochon Taylor, was the first black chairman of the board of the Chicago Housing Authority and namesake of the city’s Robert Taylor Homes public housing projects, which stood from 1961 to 2007 (one of Jarrett’s great-grandfathers, Robert Robinson Taylor, was the country’s first accredited African American architect and first black student at MIT). Her father, James E. Bowman, was a pathologist, geneticist and professor at the University of Chicago while her mother, Barbara Taylor Bowman, was an early childhood education pioneer and co-founder of the acclaimed Erikson Institute. The now 90-year-old Bowman was proudly front row on Saturday as her only child—flanked by a library wall filled with books about women, by women, for women—discussed her own contribution to the genre. Both the atmosphere and the incredibly diverse crowd were buoyant as the frank, funny and unbelievably relatable Jarrett spoke with The Wing’s Senior Director of Impact, Giovanna Gray Lockhart. Valerie Jarrett (l) speaks with Giovanna Gray Lockhart at The Wing Chicago on Saturday, April 6. For those who need a refresher on Jarrett’s political career: prior to becoming what the New York Times called “the ultimate Obama insider,” she built her career in public service in the administrations of Chicago mayors Harold Washington (the first black mayor of America’s third largest city) and Richard Daley. While Daley’s deputy chief of staff, in 1991, she hired a dynamic young attorney named Michelle LaVaughn Robinson, then engaged to fellow attorney Barack Obama. After serving in both the public and private sectors, including as commissioner of Chicago’s department of planning and development and chairwoman of the Chicago Transit Board, Jarrett joined Obama’s administration in 2008, co-chairing his transition team as well as overseeing the offices of public engagement and intergovernmental affairs. Notably, Jarrett also chaired the White House Council on Women and Girls and the White House Task Force to Protect Students from Sexual Assault. Among her still-growing list of accolades in the years since the Obama presidency, Jarrett has become co-chair of the United State of Women and chair of the board of When We All Vote. It’s a remarkable life in public service that predates most of our current presidential candidates (as well as the current president himself). And while, no, she won’t be tossing her hat into the ring in 2020 (as she was asked during her appearance at The Wing), listening to Jarrett’s common sense and compassionate approaches to workplace parity, self care and even motherhood, you almost wish she would. Valerie Jarrett (r) greets a young fan. In fact, Jarrett told The Wing’s audience it was her experiences as a young working mom that informed her views on policy. A now-outspoken woman who recalls being the painfully shy child of very accomplished parents, like many of us, Jarrett grew up subscribing to the idea of the “10-year plan.” And like many of us have experienced, Jarrett’s life didn’t exactly go according to that plan. Following the prescribed path to a successful law career didn’t lead to happiness; neither did a perfect-on-paper marriage. Jarrett says she found her path—and her voice—by deviating from the plan into single parenthood and public service, largely motivated by the desire to raise her daughter with a strong example. Jarrett shared that her experience—divorced, but nevertheless well supported financially and by surrounding family—made her aware of her own privilege, even as a single parent. Arguably, it was her sense of wanting to value and use that privilege in service of others that led her to leave a lucrative career in the private sector to a career in civic engagement. Jarrett also spoke to the perfectionist syndrome that plagues so many women—especially mothers, who frequently feel that they must do it all to have it all. Obviously, some of the harder aspects of being a working woman are issues like the gender pay gap, lack of workplace flexibility and the “bro culture” that plagues many male-dominated fields. 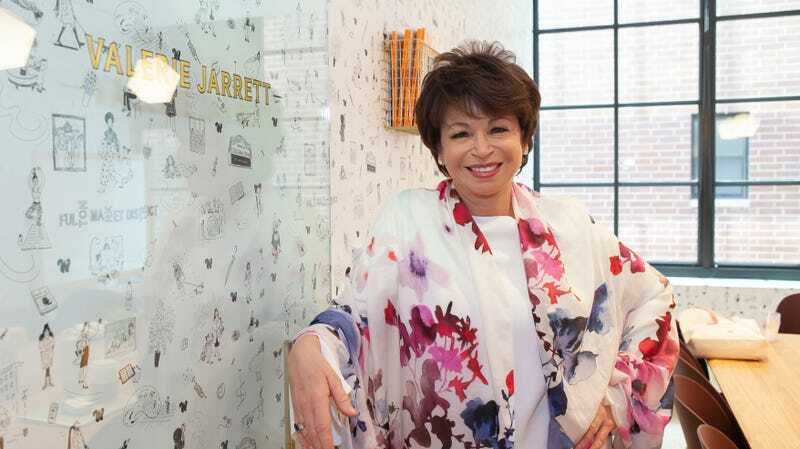 The former was an issue Jarrett helped Obama confront head-on in his administration, encouraging a “lean in” culture in the White House well before Sheryl Sandberg brought the popular phrase to zeitgeist in 2013. “Be authentic. Be who you are. Let people in … because you have to earn their trust; they’re not going to just give it to you lightly, because you have a lot of control over their lives,” she said. “I think you’ve gotta recognize that nobody’s going to hand this to you; you have to go out and earn it, and you have to explain not only why your vision for America is right, but how you are competent to execute that vision. And I think it is that level of trust that the American people deserve,” she added. The Glow Up tip: Valerie Jarrett’s Finding My Voice: My Journey to The West Wing and the Path Forward is available now. The Wing’s Chicago location opens on Thursday, April 11 on the 2nd floor of 811 W Fulton Market. Memberships start at $185 per month; you can apply to any of their locations on their website. Valerie Jarrett says we should turn Roseanne Barr mess into "a teaching moment"